Seventeen-year-old Abby Lunde and her family are living on the streets. They had a normal life back in Omaha but, thanks to her mother's awful mistake, they had to leave behind what little they had for a new start in Rochester. Abby tries to be an average teenager-fitting in at school, dreaming of a boyfriend, college and a career in music. But Minnesota winters are unforgiving, and so are many teenagers. Her stepdad promises to put a roof over their heads, but times are tough for everyone and Abby is doing everything she can to keep her shameful secret from her new friends. The divide between rich and poor in high school is painfully obvious, and the stress of never knowing where they're sleeping or where they'll find their next meal is taking its toll on the whole family. As secrets are exposed and the hope for a home fades, Abby knows she must trust those around her to help. But will her new friends let her down like the ones back home, or will they rise to the challenge to help them find a normal life? C.H. Armstrong writes issue-driven young adult and women's fiction, and freelances part time as a magazine columnist. 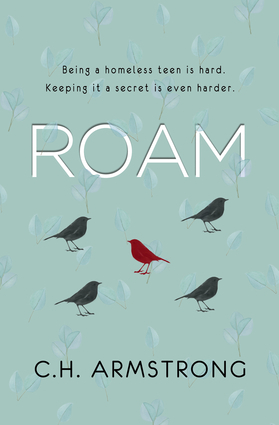 An assignment to cover the twenty-year anniversary of a local soup kitchen, piqued her interest in the homeless community, and inspired Roam.